NSX Console – Ping Forever? The Problem: From the vSphere Web Client Console (with OS X Safari) to the NSX Manager, NSX Controller, NSX Edge Services Gateway, NSX Logical Distributed Router Virtual Appliance or any Linux Guest OS, if I use the “ping <IP Address>” command, the “Control-C” key sequence is not received by the VM Console to escape the ping sequence. Close the vSphere Web Client Console and connect with the C# Client Console or the vSphere Web Client with OS X Firefox . The “Control-C” sequence will work from there. When using the vSphere Web Client Console with OS X Safari, use the command “ping <IP Address> -c <Number of pings>” to mitigate the issue (if supported, see next section). Brute force option – reboot the virtual appliance. NOTE: I could not test Internet Explorer, I was having problems with IE vSphere Web Client Console access via Parallels on my Mac. The two images below illustrate the behaviour for the NSX Edge Services Gateway Console with Safari and Firefox. Which NSX Virtual Appliances support “ping -c”? Short answer to the question, only the NSX Controller with the command format “ping <IP Address/Hostname> <Desired Count>”. The NSX Manager, Edge Services Gateway and Logical Distributed Router only support “ping <IP Address/Hostname>” or “ping ip <IP Address/Hostname>” or “ping ipv6 <IP Address/Hostname>”. So use the Mozilla browser with the vSphere Web Client for the “Control-C” exit sequence to work. 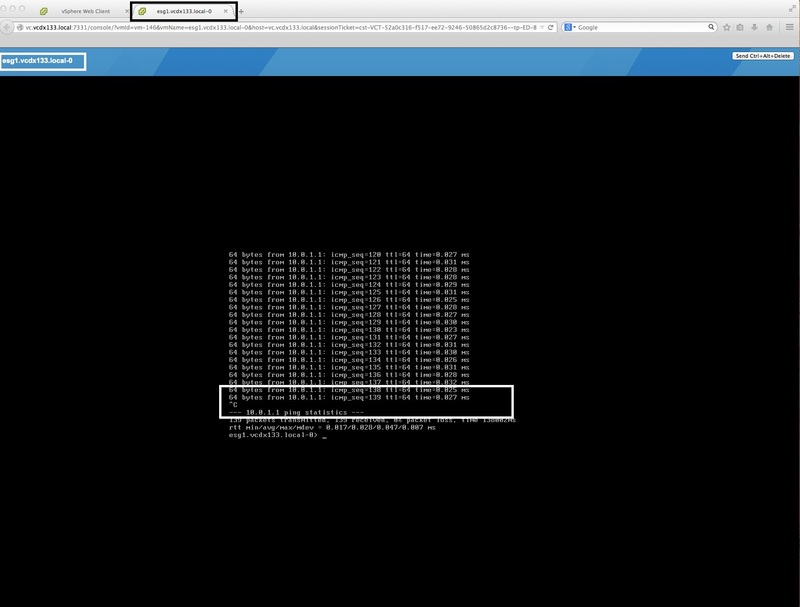 VMware: It would be nice to have command consistency across all NSX virtual appliances. I have only scratched the surface, what else am I going to find when I deep dive? As an honourable mention, RHELS 6.3 does support the command “ping <IP Address/Hostname> -c <Desired Count>”.